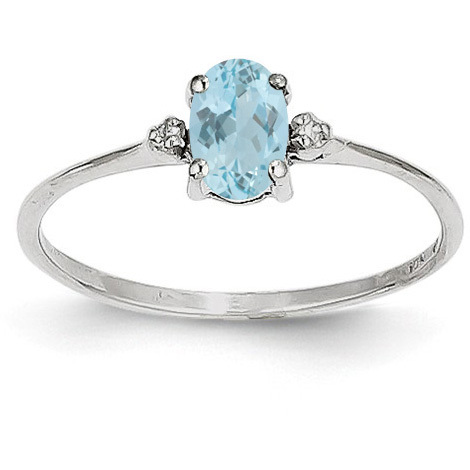 Aquamarine, a beloved and cherished gemstone, really stands out when paired with 14K white gold and diamonds in this aquamarine and diamond birthstone ring from Apples of Gold Jewelry. The soft, icy blue color the authentic aquamarine gemstone, which measures 6mm x 2mm, is matched up with two real diamonds, which total .008 carats. The 2mm 14K white gold band offers a breathtaking look when combined with the diamonds and aquamarine gemstone. We guarantee our Aquamarine and Diamond Birthstone Ring, 14K White Gold to be high quality, authentic jewelry, as described above.